The nation’s high schools are on notice to prepare for a massive shift in the way they teach, connect with, examine and prepare students for the workplace under the new 2020 digital curriculum mandated by the Ministry of Education. The image of the teacher as the font of knowledge with chalk dust flying off the blackboard is long gone. The new-era teacher is a facilitator and mediator of collaborative learning, where students access a range of digital tools and online services. This curriculum catch-up partly responds to industry concerns that digital technology has been lumped in with the traditional ‘technology’ of clothing design, food preparation, and metal and woodwork – despite it being the fastest growing sector with graduates in high demand. The future-proofing, the first change since 2007, will merge digital technology into everyday lessons, so students are better equipped to adapt, innovate, create and acquire skills for life-long learning. The big vision, consulted on from 2016, is littered with aspirational terms like flipped learning, gamification, integrated pathways, collaboration, digital textbooks, remote learning, social media and mind mapping. Dr Kathryn MacCallum, associate professor of EIT’s School of Learning believes the road ahead for many long-term teachers, already burdened with administrivia, will be challenging. In June, Education Minister Chris Hipkins launched a $12 million support programme, part of a wider $38 million funding package, to help schools and their 44,000 teachers prepare for the new digital curriculum. The well-respected academic and teacher, with business and developer skills, is currently working on a tool that teachers that might equally apply to maths, history, geography and computer science. Its augmented reality approach opens the possibility of creating a 3D model of a Māori dwelling, for example, then viewing its uses from an historical perspective. What’s important, she says, is computational thinking, teaching students how to solve problems; not just asking questions but keeping them engaged across multiple disciplines to see where their skills and interests are. The digital curriculum will encourage broader connectivity with other schools and teachers, enabling regional schools to have access to experts or course material in other parts of the country or the world. All this means having cable and wireless infrastructure for seamless internet access, which currently has Crown company, Network for Learning (N4L), beefing up capacity and security on its Managed Network for schools. It began connecting more than 800,000 students and teachers over four years ago and this first major upgrade, alongside experienced IT companies, is due for completion in October 2019. While most schools have ultrafast broadband, MacCallum says the infrastructure still needs to mature beyond raw fibre to live up to curriculum expectations, with wireless networks designed to give seamless access to an increasing range of improved apps and digital tools. 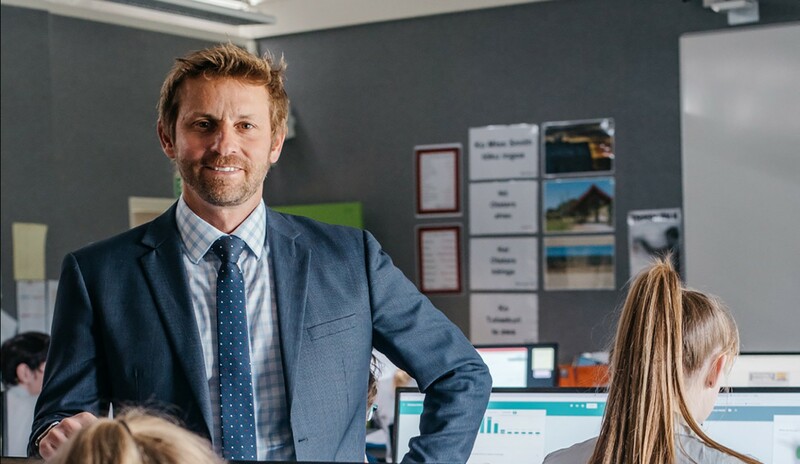 Havelock North High School is well prepared for the curriculum changes having streamlined the use of technology and devices and ensuring systems are complementary. That meant researching which digital data projectors to deploy and supporting ‘bring your own devices’ (BYOD). About 300 tablets or other devices are provided for those who for financial or other reasons don’t have their own. While there’s a trend toward remote and ‘flipped learning’ where students do online homework then discuss this at school, Wilton says the classroom still provides the best learning environment. Havelock High has mandated Google Classroom, a free web service for creating, distributing and grading assignments, as well as the complementary Schoology learning management system, which enables students to communicate with their teachers. Students become familiar with the tools most businesses use, and arrangements with the Ministry of Education and big providers like Google and Adobe are making it easier to implement technology and keep costs down. In media studies they use the same software as Weta Workshop; in music it’s the composition tools used at university; and in art Adobe products such as Photoshop and InDesign. EIT’s Kathryn MacCallum says there’s been a lot of agonising over technology in schools, including the ongoing Apple versus PC operating systems debate and whether iPads, tablets, laptops or Chromebooks were suitable. She says Chromebooks are suited to an internet-only environment and smart phones and desktop PCs are generally perceived as unsuitable for much of what the curriculum will require. Most web developers are now focused on mobile devices; “for education in particular it needs to be cross portable,” says MacCallum. Part of the solution is to focus on apps and tools from the cloud, which eliminates most interoperability and product update issues and doesn’t require the latest and greatest computers. So, with increasing focus on web research and study, how do you deal with ‘fake news’ and biased reporting? Havelock High students all take the Encompass programme which addresses research skills, writing CVs and other areas outside normal coursework. And there’s a strong media studies course which critiques the media and how it works and influences people’s decisions and thinking. Wilton says schools should make an effort to keep in touch with changes in the wider technology world, the marketplace and university. Engaging or partnering with industry, alongside school career guidance, supports more authentic learning with students working on real problems and training around industry needs. “At one stage we had half a teacher in careers counselling; now we have four permanent career guidance staff coordinating students in the workplace through the Gateway programme,” says Wilton. Examining the exams While school management, monitoring and teaching systems have a lot more information about how students are progressing toward qualifications, Wilton says NZQA exams and assessments have remained relatively unchanged over the past decade. MacCallum is concerned that if the curriculum continues to be based around current unit standards it could inhibit progress and constrain how creative students can be. It’s more than just a game; they had to write a storyline, use film and graphics, get feedback from people, make system changes and market it. MacCallum says there’s still “a lot of work to do on how we assess students, how they gain credits and what future qualifications will look like”. And schools are going to have to get smarter with their data. Instead of storing it up to show the MoE how well they’re performing, the “richer data” flowing from the new curriculum should be showing how well schools are interacting with and helping students succeed. NOW sponsors the BayBuzz Technology Series to enhance public understanding of our region’s technology achievements and opportunities. Analyses and views presented are those of BayBuzz and its editorial team.